Using slide projected images, taken over two years - in South Africa, Poland, Lithuania and Melbourne - along with live piano composition, installation, video projection and sculpture, Eyton Rd moved audiences through a series of interlinking personal stories. From the ports of Trieste in Italy to Melbourne's harbour in the 1950's to South African backyard gardens during Apartheid, Eyton Rd attempts to connect two different families as they navigate across the globe in search of new lives. Although Eyton Rd is a collection of personal fragments and fragile glimpses, it is also a universal story that has occurred to many throughout time and continues to occur daily. Many continue to be displaced worldwide without choice. Eyton Rd is dedicated to all those who, through human rights violations, are still searching for their own place to return to. Eyton Rd's research trip through Eastern Europe was supported through the Ian Potter Cultural Trust and the La Mama Gwandalan Award. 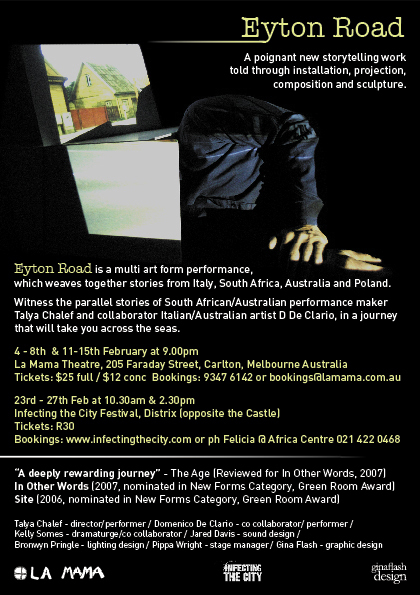 **Eyton Rd premiered at La Mama Theatre in Melbourne before it toured to the Infecting the City Festival in Cape Town in February 2009.